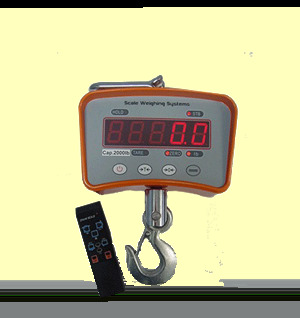 The SWS-7910 Crane Scale is a rechargeable battery powered electronic crane scale. With Automatic and manual HOLD function, remove what you are weighing before recording your results easily, your result stays displayed until you weigh your next sample. LED display offers low power consumption enabling you to have extended battery life. Use your scale for up to 50 hours before having to recharge its batteries and when the batteries run low know it the minute they are, with a low battery indicator. Save time with quick function keys including ON/OFF, Zero, and TARE. 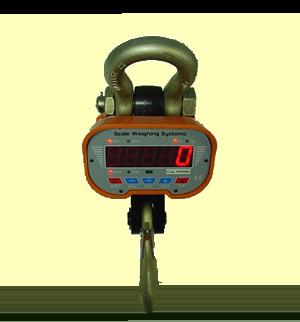 The SWS-7910 Crane Scale Series is built to last with its sturdy aluminum die casting and features a wireless remote control withhold function. The 7910 Series Crane Scale offers a compact portable design and will give you years of trouble free operation. Useful in many environments, including recycling, material handling applications and shipping/receiving. The SWS-7911 Series Heavy Duty Crane Scale is ideal for a variety of overhead industrial weighing applications including shipping & logistics, machine shop, recycling and more! The SWS-7911 is AC/DC and features a built in, long lasting (approximately 80 hr.) battery life between charges. A Bright Red 1.5" high LED display makes the display easy to read even in low light areas from a distance. The SWS-7911 also features a wireless remote with a hold function. Use the table above to find the part number you desire then click "Add To Quote."